We’d love your help. 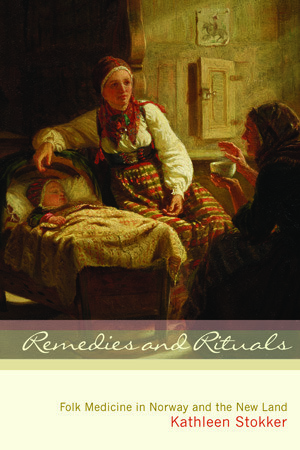 Let us know what’s wrong with this preview of Remedies and Rituals by Kathleen Stokker. To cure a fever that begins with chills, write the following on a piece of bread and give it to the patient for eight days, one piece each day, and on the ninth day, burn the last piece: Colameris x, Colameri x, Colamer x, Colame x, Colam x, Cola x, Col x, Co x, and C x. To prevent the huldrefolk from stealing your healthy child and leaving a child with rickets in its pla To cure a fever that begins with chills, write the following on a piece of bread and give it to the patient for eight days, one piece each day, and on the ninth day, burn the last piece: Colameris x, Colameri x, Colamer x, Colame x, Colam x, Cola x, Col x, Co x, and C x. To prevent the huldrefolk from stealing your healthy child and leaving a child with rickets in its place, make three dolls from the child’s clothing to put into the cradle. The huldrefolk will take one of them instead of your child. These and many more fascinating folk-healing rituals were secretly administered by healers, “witches,” and religious caregivers who tended the medical and spiritual needs of rural Norwegians for hundreds of years. In Remedies and Rituals, Kathleen Stokker culls from hundreds of original documents and first-hand accounts to detail the ingredients, customs, and histories behind natural remedies, potions, whispered spells, and the infamous “black books” used for centuries by Norway’s folk healers. Stokker also illuminates the surprising personalities of those who risked imprisonment and persecution to help fellow Norwegians throughout the nineteenth century, as well as the often reluctant healers in the U.S. who continued to treat immigrants living in rural communities beyond the reach of doctors. Dodging harsh criminal laws championed by formally trained doctors, these rebel practitioners drew on ancient written and oral sources to treat everything from burns, broken bones, and whooping cough to difficult labors and emotional stress. To ask other readers questions about Remedies and Rituals, please sign up. This was an interesting and well researched treatise on the folklore surrounding health care among sixteenth to nineteenth century Norwegians, both in Norway and in North America. Not unlike many rural, isolated cultures, the “almuen” (or peasants) and their relatives who immigrated maintained a variety of traditions to care for their own health problems. Kathleen Stokker writes in an engaging, sympathetic voice, providing detailed primary sources for the remedies - herbal, magical, and social - This was an interesting and well researched treatise on the folklore surrounding health care among sixteenth to nineteenth century Norwegians, both in Norway and in North America. Not unlike many rural, isolated cultures, the “almuen” (or peasants) and their relatives who immigrated maintained a variety of traditions to care for their own health problems. Kathleen Stokker writes in an engaging, sympathetic voice, providing detailed primary sources for the remedies - herbal, magical, and social - used by common people. From doctor books (legeboker), to commonly used herbs, to bloodletting, Stokker shares a smorgasbord of fascinating information. Her focus on a few famous folk healers, some of the effective cures they developed, and the religious and social contexts that made home medecine a necessity for most of the population was empathetic and thought provoking. The book can get pretty harrowing as Stokker records various stories of injuries and sickness in the isolated Norwegian countryside or the midwestern prairie, when so many children were hitting themselves with axes or stepping onto a hot anvil. That the tellers were able to recover with the help of their parents and a few sliced potatoes or hits of turpentine shows how innovative they could be. Particularly sobering were the chapters on child birth and rickets, and the host of legends surrounding this formerly mysterious childhood disease, in particular that of the huldrefolk replacing a healthy child with a changeling, illustrating how bleak medical conditions could be in an era before knowledge of germ theory and nutrients. Of course, medical science, at the time, often offered no better treatments or, in some cases, worsened conditions. Most interesting was the information on the “black book,” those mysterious and frightening books of magic of which legends sprung up all over Scandinavia, and which many actually existed. Featuring handwritten formulas and prayers a person scrawled down to stop bleeding, heal bones, or other needs, their diabolic reputations stem mainly from their relation to pre-Reformation prayers and theology- anathema to the rigid Lutheran authorities of the time, who nonetheless provided much of the medical knowledge of the time themselves.